If you are on TV – which I was rather a lot in the ’seventies – you get invited to open fetes and visit places you might never otherwise see. And you have to be stupid not to see the contrast between a well-paid life, full of applause, and the circumstances of some of your audience. In particular, there was a group of disabled people in Wandsworth called the Tuesday Crowd (because they met on a Tuesday) who invited me to be their Patron, and showed me a side of life I had never seen. I am still their Patron, even though after five years they confessed that the member who asked me had meant to ask Leslie Crowther, but had got confused. Like many people I saw Michael Buerk’s report from Ethiopia in October 1984. At that time Starlight Express had been running for six months, and I was getting royalty cheques every week. So Annabel and I were in a position to support the Appeal, and we did. That felt right and so we started a thing called the Alchemy Foundation. The Foundation receives royalties from the American productions of Starlight Express and The Phantom of the Opera and distributes money to good causes chosen by the Trustees (a full list of those Trustees and the annual accounts can be found through the Charity Commission). Particularly, but not exclusively, these causes are the provision of water and sanitation in the developing world through Wateraid – my father and grandfather were both water engineers – disability charities, prisoner education and rehabilitation, carers, and young people doing gap years in challenging places. The Foundation’s latest venture is the Alchemist Scheme, which places skilled fund-raisers with particular charities. And then there is the Orpheus Centre. One of the things I was asked to do locally was help with Riding for the Disabled. I know nothing about horses, but I had found that playing the piano to the Tuesday Crowd usually cheered them up, and the special schools where I had opened fetes never seemed to do enough music. So why not Music for the Disabled, as well as riding? I met a remarkable neurologist in Northern Ireland called Michael Swallow, who was running music weeks for disabled people with another remarkable man – a musician called Richard McNicol. I hitched on to their coat tails, and for some years we ran thrilling (for me) musical weeks with odd people in odd places, always with a final-night performance as the common challenge. The effect of this on all of us was so remarkable that it seemed logical to start a place where disabled people and students could work together for longer than a week – to change their own and other people’s lives by writing songs, making music and performing in public. Thus was born the idea for the Orpheus Centre, which opened in 1997 at my former home in Godstone, Surrey. Orpheus started with five students – Jamie, Angus, Danny, Lorna and Rory – all with various disabilities. They lived there, learnt to cook, budget, do laundry and go shopping, and they wrote songs, made dances and amazed everybody they performed for. Four of them (one sadly died soon after leaving) are now living independent lives and doing useful things. They say they wouldn’t be doing the things they are doing without their experience with Orpheus. One of the main functions of this website is to enable people to download lyrics and poems I have written over the years, in return for a donation to the Orpheus Centre Trust. Thank you in advance, and if you ever get a chance to see one of the Orpheus performances then grab it. It will change your life a little. We have £10million of Arts Council lottery money to distribute each year, and we have so far reached over two million children all over the country, and believe that we have benefitted every one of those young lives. When Gavin Henderson, the original Chair, retired in 2007 I succeeded him eventually retiring in 2012. I have enjoyed my involvement with this and with Orpheus as much as anything I ever did on a stage under the bright lights. 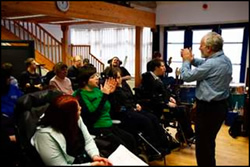 The Orpheus Centre supports young disabled adults in their transition to independent living. Our students gain confidence and self-esteem through performing arts and learn essential skills for life. I was until 2012 Chair of this charity which aims to give music-making opportunities of all sorts to young people who otherwise would not get them.